The Case Against Multivitamins Grows Stronger : Shots - Health News Vitamin deficiencies can cause deadly diseases like scurvy, and other major health problems like spina bifida. But for most people, adding a multivitamin to their daily routine doesn't affect their health at all, studies say. Still, 40 percent of Americans continue to take multivitamins. When I was growing up my mom gave me a multivitamin every day as a defense against unnamed dread diseases. But it looks like Mom was wasting her money. Evidence continues to mount that vitamin supplements don't help most people and can actually cause diseases that people are taking them to prevent, like cancer. Three studies published Monday add to multivitamins' bad rap. One review found no benefit in preventing early death, heart disease or cancer. Another found that taking multivitamins did nothing to stave off cognitive decline with aging. A third found that high-dose multivitamins didn't help people who had had one heart attack avoid another. "Enough is enough," declares an editorial accompanying the studies in Annals of Internal Medicine. "Stop wasting money on vitamin and mineral supplements." But enough is not enough for the American public. We spend $28 billion a year on vitamin supplements and are projected to spend more. 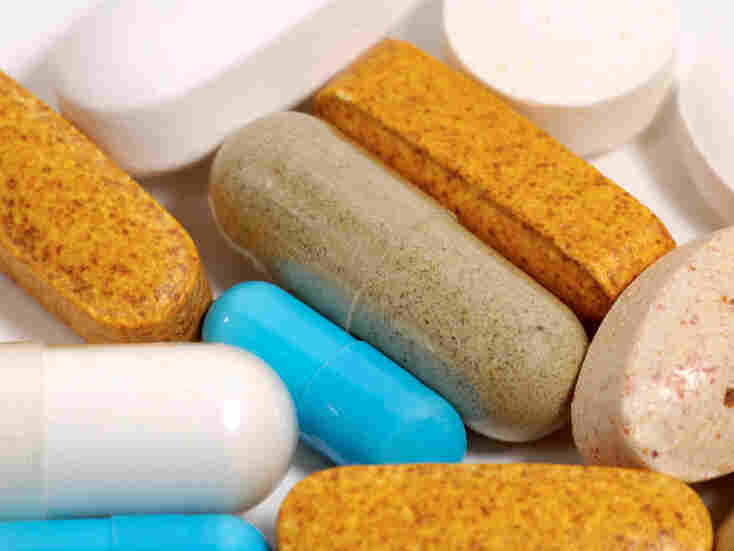 About 40 percent of Americans take multivitamins, the editorial says. Even people who know about all these studies showing no benefit continue to buy multivitamins for their families. Like, uh, me. They couldn't hurt, right? In most cases, no. But $28 billion is a lot to spend on a worthless medical treatment. So I called up Steven Salzberg, a professor of medicine at Johns Hopkins who has written about Americans' love affair with vitamins, to find out why we're so reluctant to give up the habit. "I think this is a great example of how our intuition leads us astray," Salzberg told Shots. "It seems reasonable that if a little bit of something is good for you, then more should be better for you. It's not true. Supplementation with extra vitamins or micronutrients doesn't really benefit you if you don't have a deficiency." Vitamin deficiencies can kill, and that discovery has made for some great medical detective stories. Salzberg points to James Lind, a Scottish physician who proved in 1747 that citrus juice could cure scurvy, which had killed more sailors than all wars combined. It was not until much later that scientists discovered that the magic ingredient was vitamin C.
Lack of vitamin D causes rickets. Lack of niacin causes pellagra, which was a big problem in the Southern U.S. in the early 1900s. Lack of vitamin A causes blindness. And lack of folic acid can cause spina bifida, a crippling deformity. Now when public health officials talk about vitamin deficiencies and health, they're talking about specific populations and specific vitamins. Young women tend to be low on iodine, which is key for brain development in a fetus, according to a 2012 report from the Centers for Disease Control and Prevention. And Mexican-American women and young children are more likely to be iron deficient. But even in that group, we're talking about 11 percent of the children, and 13 percent of the women. Recent studies have shown that too much beta carotene and vitamin E can cause cancer, and it's long been known that excess vitamin A can cause liver damage, coma and death. That's what happened to Arctic explorers when they ate too much polar bear liver, which is rich in vitamin A. "You need a balance," Salzberg says. But he agrees with the Annals editorial — enough already. "The vast majority of people taking multivitamins and other supplemental vitamins don't need them. I don't need them, so I stopped." I'm still struggling with the notion that mother didn't know best. But maybe when the current bottle of kids' chewable vitamins runs out, I won't buy more.